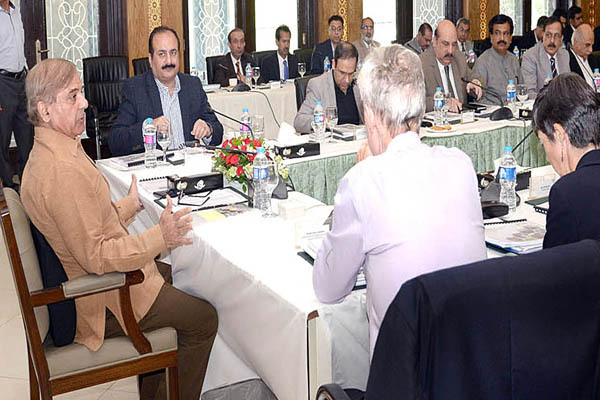 LAHORE, Oct 07 (APP):Punjab Chief Minister Muhammad Shehbaz Sharif on Saturday presided over a three-hour meeting here to review progress on the School Reforms Road map Programme. in this regard and considerable progress had been made in achieving targets. He said education standards had improved due to introduction of IT. of education had increased in these schools after the initiative of public-private partnership. every child and this right would be ensured at any cost. and the project was the biggest project of South Asia. we should work as a team to achieve targets of the road map reforms. was proceeding with the road map program in excellent manner and immense improvement had been noted in the enrolment and education quality. Shehbaz Sharif had promoted merit and transparency in every field. Chief DFID Joanna Reed said the Punjab government had made remarkable progress in the education sector under the strong leadership of CM Shehbaz Sharif and Punjab was moving in the right direction under his leadership. of Chief Minister Shehbaz Sharif in the education sector were praiseworthy, Joanna added.